We often gets calls from hotels whose banquet bars are out of control. Whether the liquor pour cost is high, the employees are stealing cash or clients have complained about being overcharged on a host bar, the main culprit is usually a poor system for recording sales. While our hotels all have the most advanced property management systems at the front desk and the most advanced point of sales systems in our restaurants and bars, our banquet bars have cheap cash registers purchased from Costco! Or worse yet, the old adding machine tape next to the cash drawer! Finally, technology has caught up with the demand. 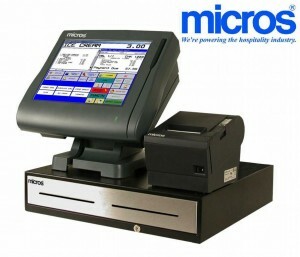 Most hotels use the MICROS 3700 or the MICROS 9700 point of sale system in their restaurant and bars. Now it is very easy to add on an affordable, portable terminal and put in the same controls in your banquet bar as you have in your restaurant bar. The terminal runs on wireless internet and connects to your existing point of sales system so it is ultra portable. All that it needs is power. Depending on the size of your hotel’s banquet space, most hotels can get by with only one or two terminals. How will adding a point of sales system to your banquet bar increase sales? 1. Your hotel will now be able to accept credit cards at a banquet event. People tend to spend much more money at a place (especially a bar) when using a credit card. 2. Many people at a business event will not purchase drinks unless they can use a company credit card and get a receipt. If you have ever attended an HFTP event, you have been in line behind a group of Controllers that want to pay with a company credit card and need a receipt for the expense report! 3. You will greatly reduce your risk of employee theft. You may be losing 20 percent of your revenues to theft right now. With a POS, the bartenders will have to ring up each item and present a receipt. More of the hotel’s money will make it into the register instead of ‘accidentally’ going into the tip jar. If you have installed a Point of Sales System in the last few years or are planning to install one in the future, be sure to consider incorporating a banquet bar terminal. It will pay for itself in no time!